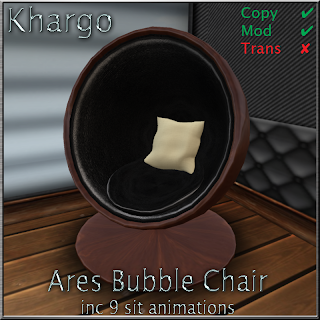 The Ares Bubble Chair is made with a menu that lets you change textures (over 60 textures included), tint, shininess, glow and brightness. This way Ares can be changed to any style you want. The owner also has the option to make the menu available to everyone or only to himself. This menu is activated by clicking on the shadow prim of the item. It also has the option to choose between 9 different single animated sits. Just click the cushion you sit against and you ll get a blue pop up menu from which you can choose your next pose. Check out the sits and some of the possible texture combinations here. It also has the option to adjust the position of your pose just by saying "/1a" in open chat. This is done because every AV has a different height. This way you can make them fit perfectly to your height.